Children often enjoy guessing, counting and imagining. Adults could provide a variety of sealed boxes, provoking children to discuss what might be inside. Show the children a sealed box containing a range of objects which differ in size, weight and ability to rattle! Ask them what might be inside the box and following this up with questions to encourage them to think and apply their knowledge and past experiences. Try to build up the suspense so as to hook the children in! Tell me (a bit more about) what you think is inside the box. How big is it/are they? How many of them are there, do you think? Why do you think it is/they are inside? Why do you think it is/they are that size? Why do you think there are that many? Can you find another box that could just hold a ...? How many ... could you fit inside? Here are some other different boxes. How many ... could you fit into each of them? 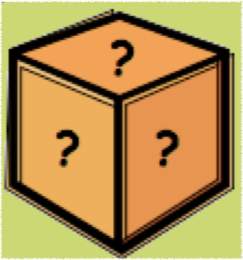 Would you like to make a drawing of what’s inside this box? The activity Presents in the NRICH EYFS collection could be a follow-up to this one. It focuses on ordering wrapped presents according to their weight. Once the contents of the box have been revealed, you could challenge children to put specific numbers of objects inside it. Listen out for reasoning that reflects the fact that smaller objects take up less space, therefore more of them can be fitted into the box compared with larger objects. You could add context to this activity by linking it to a recently-read story or role-play theme. The boxes could become, for example, suitcases or trunks. Try to select items that the children are used to seeing in the setting, or have experience of from elsewhere. With thanks to Kirsty Lombari at Ludwick Nursery School who was the inspiration for this activity.